Jn 3:16-18 God so loved the world that he gave his only Son,so that everyone who believes in him might not perishbut might have eternal life.For God did not send his Son into the world to condemn the world,but that the world might be saved through him.Whoever believes in him will not be condemned,but whoever does not believe has already been condemned,because he has not believed in the name of the only Son of God. Today is the one Sunday in the liturgical year that priests and deacons are encouraged to preach about the Blessed Trinity (We call this day Trinity Sunday). When I was attending “Deacon School” one of our teachers told us that this is the most difficult day of the year to preach. Simply put… How can you describe that which cannot be understood? Now… When the fathers of the Church tried to make sense of Jesus teachings about God they turned first to scripture, but there they where only told that there is one God, and that this God is the Father, the Son and the Holy Spirit, that’s it… It was through a long process of theological reflection that the Holy Spirit guided the Church to define each one of these divine persons. All this reflecting took about 400 hundred years. On Trinity Sunday, my seminary professor told us, we get to explain all this in just 8 minutes! The fathers of the church never defined how one being can exist in tree unique person. Very early in their reflection they realized that the mysterious nature of God can never be understood by the human mind. Of course this does not mean we should not spend time thinking about it. Personally I like to think that the Blessed Trinity is like a diamond with an infinite number of facets, each one giving away a very unique spark of light. We can stare at anyone of these facets and discover much beauty and wisdom, we can even see ourselves reflected in these sparks of light, but although we can hold this diamond in our hands, we can never see it as the precious stone it really is until we are standing in front of the throne of God in heaven. So today, in the 5 minutes I have left, what I’m going to try to do is to show you one of these facets. Today’s gospel is the very famous John 3:16 passage in which we are told that God the Father (the First person of the Trinity) loved the world so much that He gave His only Son (Second person of the Trinity) so whoever believed in Him (through the action of the Holy Spirit, the third person of the Trinity) will not be lost. What we are going to do is concentrate in this divine action of “giving”. Of course we cannot avoid talking about this “giving of His son” without talking about The Blessed Mother because in the process of this giving, Mary experienced the Blessed Trinity in a way that no other person in creation did. To explain this I will use… The rosary… (Don’t worry we will not do the whole thing only these 3 beads) When I was a kid I learned the rosary by listening to my parents pray it. 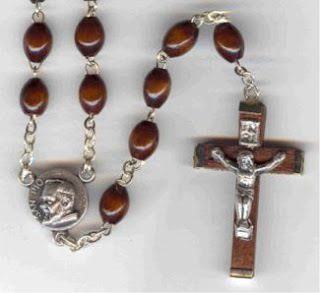 In the Spanish version, I learned to pray these 3 beads differently than in the English version, Instead of saying “Hail Mary Full of grace the lord is with you…” three times, I say, Hail Mary daughter of God the Father, full of grace the lord is with you… the next time I say Hail Mary Mother of God Son, full of grace the Lord is with you… and Hail Mary Spouse of the Holy Spirit”… between the last Hail Mary and the first Glory Be I say, Hail Mary temple and tabernacle of the most Blessed Trinity. Now there is a deep theology behind these simple words. Mary was first the Daughter of God the Father, in the book of Genesis we read that after the fall God said to the serpent “I will put enmity between you and the woman and between your offspring and her offspring”. When God is formulating the plan of salvation, He is thinking about how he will “give” His son to us. I ask you brothers and sisters, how can this woman in genesis be any other than the Mother of His son given to the world so that “everyone who believes in him do not be lost but receives eternal live”? From the first moments after the fall God was thinking, planning, and molding her into His most perfect daughter. Hail Mary Daughter of God the Father! But Mary is the mother of The Son, she is the great Theotokos that brings and makes this giving of God’s only Son possible! She is true mother because Jesus is true man. She gave Him her own flesh and blood; she cared for Him, protected Him and taught Him. One must wander how many times when we listen Jesus praying in scripture, what we are listening is Mary’s voice as she must likely taught Him to pray the psalms as a child. Hail Mary mother of God the Son! And Mary is the perfect spouse of the Holy Spirit! We hear in the story of the annunciation that she was overshadowed by the Holy Spirit. The spirit of God, this infinite mystery we are trying to understand today, did not overwhelm her or overcome her but overshadowed her. In the same way that spouses are supposed lose each other in the arms of their beloved, she was united in a loving embrace with the spirit of God. We can almost imagine this beautiful young girl surrounded by this cloud of love, giving her divine spouse and eternal “yes”… A “yes” that brought forth the only son of God so that all that believes in Him never be lost. Hail Mary Spouse of the Holy Spirit! Now, we know that God is one being that exists in three persons. By the way he chooses Mary to make the “giving” of His only Son possible, this existence becomes clear. In the same way that Jesus exists in our tabernacle, and in this temple, the Most Blessed Trinity revealed its existence through Mary. So that when we look at her through her relationship with each one of the divine persons, Her relationship with the “One God” we can honestly say, Hail Mary, Temple and Tabernacle of the Most Blessed Trinity. Now, what can we learn from all this about the Trinity? Well, when we look at the divine action of “giving” through Mary, we see that although undertaken by the 3 divine persons, the act in perfect unity and harmony. We can look at any action from God, the Eucharist, baptism, reconciliation; all these are actions of God undertaken by the three divine persons in perfect unity. It is incredible what we can see when we stare in faith to one of the infinite sparks of light that is the Trinity. I hope that my explanation today awakes your desire to learn more about the nature of God, and in discovering new things about the trinity you deepen in the love of God who gave His only son so that we can have eternal live. Amen.